Trying to run off the limited success of Abe – Vampire hunter comes this offering with a surprisingly low budget (as far as I can find) of only $150,000. This film was surprisingly entertaining and really, for me at least pushed the boat out on good acting/writing and on the effects side for such a low budget. This should be set as a ground mark for future ultra-low budget b-movies as I was incredibly impressed by it. I would put a chunk of that success down to Richard Schenkman whose got a quite an impressive resume under his belt nothing to massive but a good line up of films spanning back to 1995. So we join a couple running through a forest, I think its Abe’s parents at the beginning we then see a young boy chopping wood outside when he hears a gunshot and goes running inside. Apparently his dad has not had the guts to do away with his zombified mum/wife. We then see the battle of Gettysburg waging and then cut to the white house the now adult Abe (played by Bill Oberst who is literally a film work horse his acting is a little iffy in most of his films and 90% of them are very bad b-movies as well so I guess that picked up in this because I think he plays an excellent Abe) he learns that a cannibal disease is in a fort that they need to capture to help turn the tide of the war. Having had experience with this as a young child, unknown to the others that is. He goes to see an only survivor from a small team sent to take the fort. Abe after his general is killed by the escaped sick man chooses to take a small team of the new secret service to the fort to take it and stop the disease from spreading further. Now the main storyline is a little weak I will admit that, but the strong writing even in that shows through. The acting is brilliant for a b-movie I know I’ve said it before but it does shine through, in the fort they encounter rebels and have a gun fight as zombie invade through an earlier broken door. Some die as they fight off both sides, the rebels retreat and Abe and the team re-block the door to the fort. The rebels are then caught after a little confrontation; they think the disease is treatable whereas Abe knows best. So my thoughts on this movie, as I said the effects for the small budget are fantastic they really try their best to make it look authentically 1800’s and use good locations and even some decent CGI to make places look authentic. The blood, deaths and all is as good as you can get for the budget too in fact I’ve seen similar or worse in films with 10x the budget. Make-up effects are top notch zombie make-up white eyes, grey pallor and veins showing through, really loved all that. All that coupled with a decent main character kept me engrossed in this film from start to finish. Now all the bad points and even though I love this film and loved Abe the rest of the cast seemed very 2D and had no depth. The zombies seem to have increased strength at times and feeble others. The actual film does look like it was all filmed in one day, but then as a downside it can’t be that bad as it just means they had a brilliant day of shooting. Also and please I’m not racist in the slightest the black guy in this movie is not persecuted for his skin colour at all and back in that time I’m sure he would have been he does in fact become one of the more interesting characters. The film did sag a little in the middle unfortunately as their trying to fill in for time but the story picks back up after not to long and comes to an exciting conclusion. 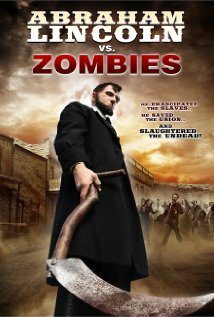 So the rest of the film is confrontations between both the confederations and the zombies, in their morals, the zombie disease and how to deal with problems. As always here on The Horror Nation I’ll not spoil the ending for you all, I’m also on the wire about giving this a four or five star mark. I really enjoyed it for the over the top action and the effort put in for the budget. The whole experience and the time frame it’s in did immerse me. So apart from its downsides which are a few I’ll give this 5 for amazing effort and great style in the face of budget adversity. Definitely worth a watch.